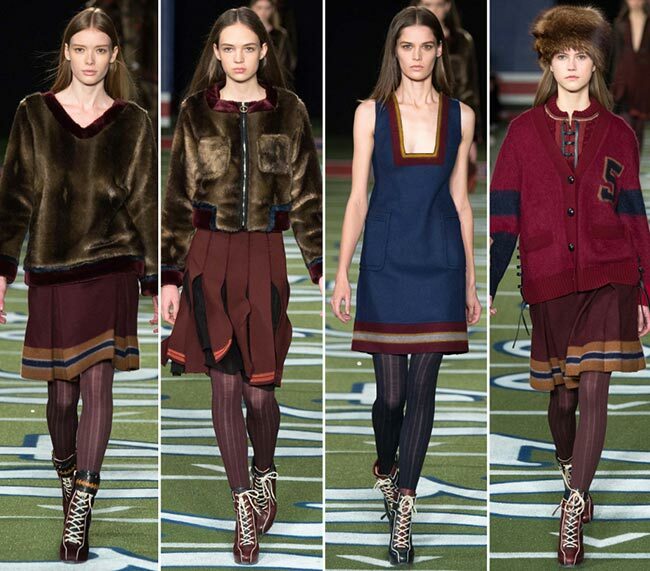 The Tommy Hilfiger fall/winter 2015-2016 collection just launched at New York Fashion Week celebrates the 30th anniversary of the brand with an array of youthful, fresh, extremely wearable and just perfect clothing pieces using American football as inspiration. 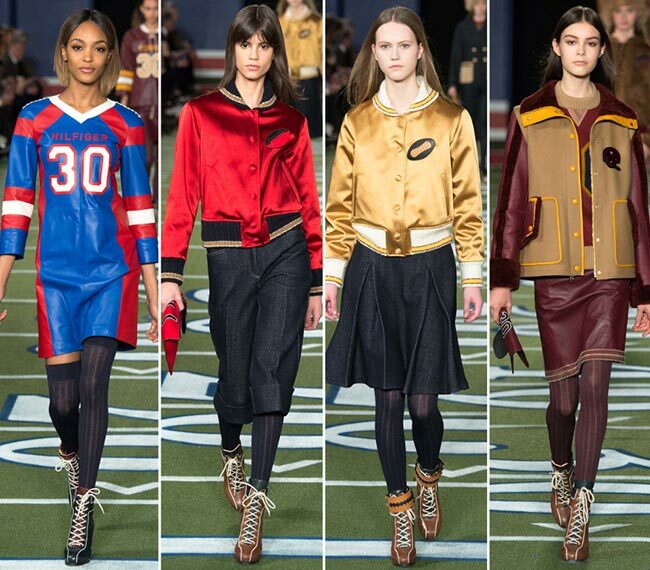 Mr. Hilfiger transformed the Park Avenue Armory into an authentic football stadium with a real Astroturf field, where the players were leggy beauties dressed in cool and cozy outfits in the trendiest colors of the season. “I’ve always been inspired by American football. 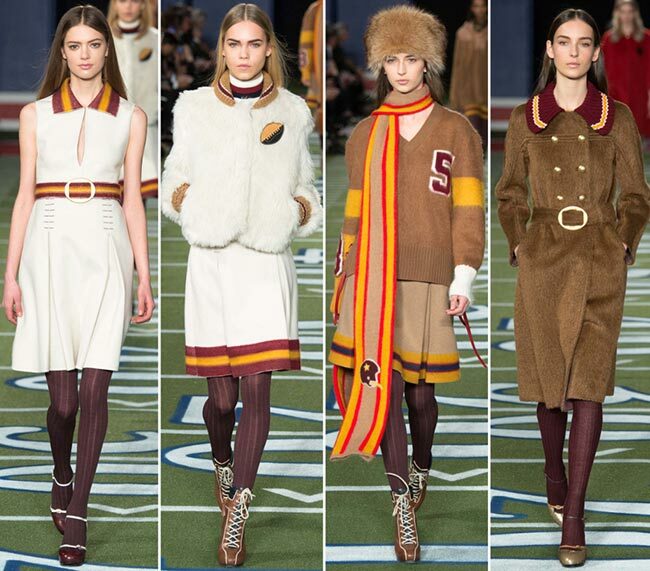 I love the uniforms, I love the game, I love the energy,’ stated Hilfiger backstage talking about the idea behind his designs. He did, actually, manage to transfer his love for football and the energy into his designs through the correctly picked colors, shapes and clothing combinations that instantly won our hearts and admiration. Tommy Hilfiger can rightly be considered one of the founders of the traditional American style clothing that is enjoying a big love and popularity throughout the world. He knows how to cite American history and culture in his designs and he always does this so flawlessly giving birth to cheerful and youthful pieces that we all hurry up to add to our new season wardrobes. 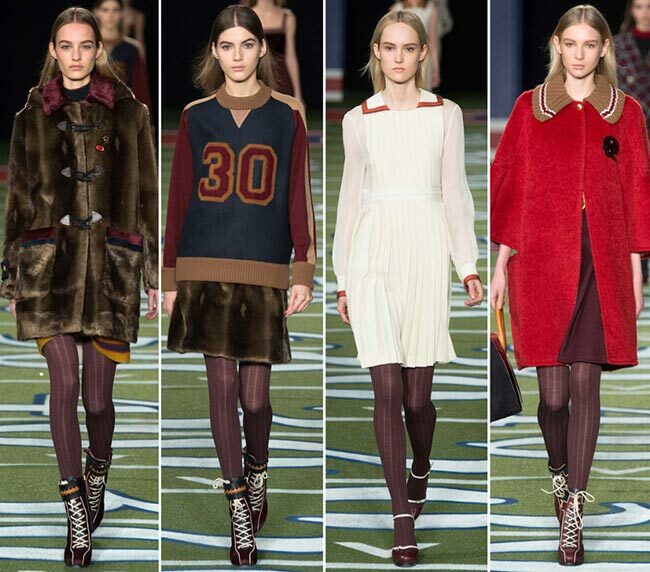 The new Tommy Hilfiger fall/winter 2015-2016 collection doesn’t go too far from the brand’s roots and from America and combines football references with classic American sportswear. 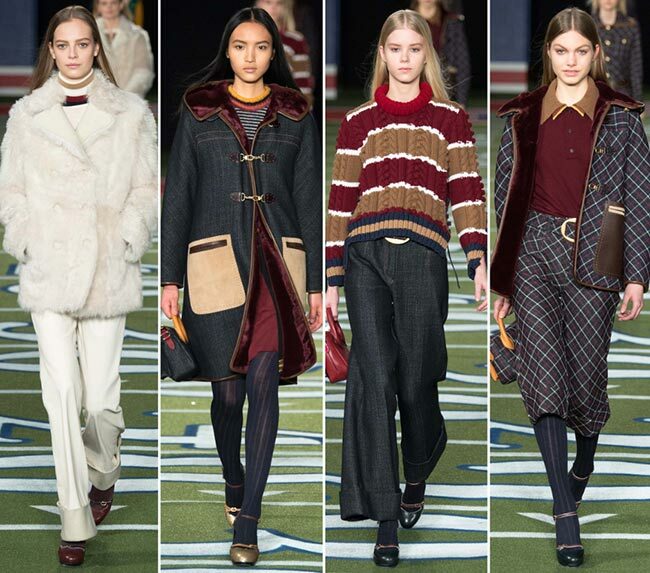 The entire collection was drenched in a fall-ready color palette composed of maroon, navy blue, camel, cream and gold tones that looked so rich and modern thanks to the unique design interpretations and the details and prints they were combined with. Of course, we saw lots of number prints, particularly 30s symbolizing the 30 years of the brand. 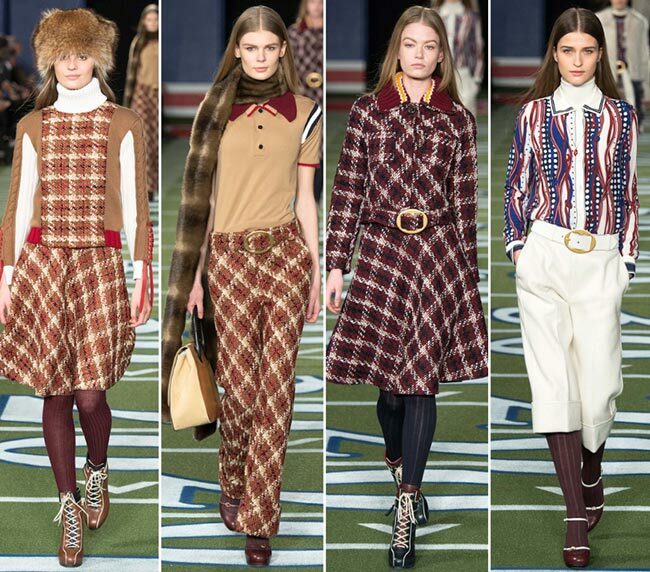 Checkered patterns and colorful stripes were other prints used, while in the majority of cases the designer had turned to interesting color-blocking techniques and texture combinations to break the monotony and inject intrigue into the looks. 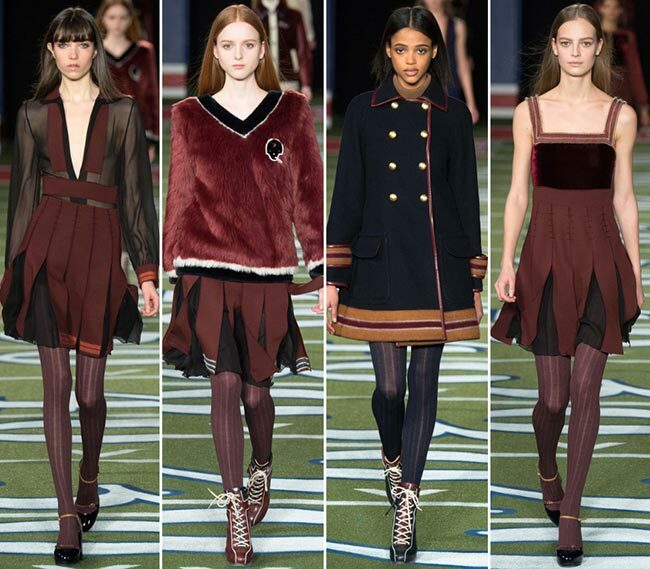 Fur is a huge trend for fall 2015 and the Tommy Hilfiger fall/winter 2015-2016 rtw collection proves this once more. It is used not only for the warm outerwear pieces, but also acts the main material for fluffy sweaters and skirts that look warm enough not to ask for any coat to top the outfit. Some of the looks come finished off with big fur hats so perfect for the countries that see severe winters, like Russia. 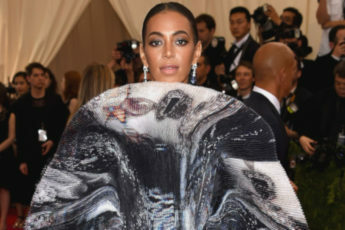 In addition to the fur coats, there are also colorful satin varsity jackets, oversized leather peacoats in bright colors decorated with a sporty stripe trim, as well as elegant tweed coats in a checkered print. 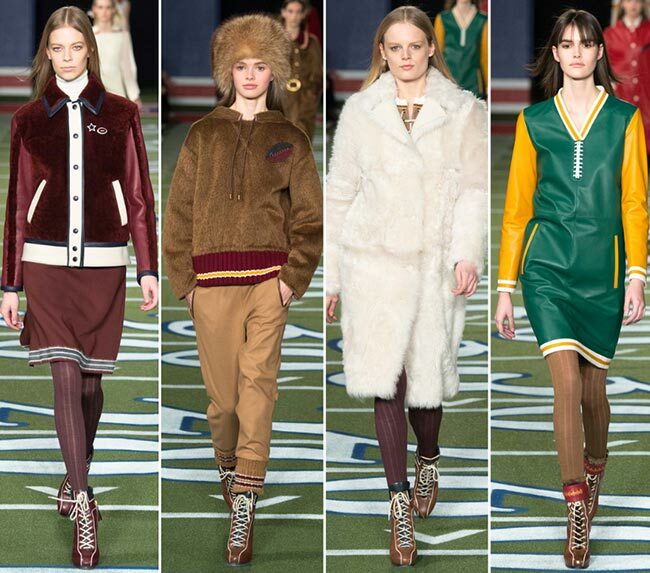 Warmth is provided to the collection also through chunky knits and mohair, while the brightly colored leather football jerseys with number prints come as perfect casual and party ensembles for the young. There is also a distinctive Seventies mood present in certain designs, like the matchy-matchy two-pieces or the bell-bottom dark wash jeans. At the finale of the show, we saw some sophisticated and whimsical little dresses and frocks mixing velvet with satin and featuring lovely pleats for extra playfulness. Overall, it was a very bright, playful and happy collection and, boy oh boy, we die for the footwear used as well!